procession known as the Baraat.. He is accompanied by family members, groomsmen, and friends known as bara at is . Hearing the sound of the Indian drum in the distance is the kind of thing that gives you tingles, signifying something loud, proud and exciting approaching. The approaching noise is usually followed by a colourful procession bringing a bride-groom to his wedding, where he’ll be joined together with his wife. 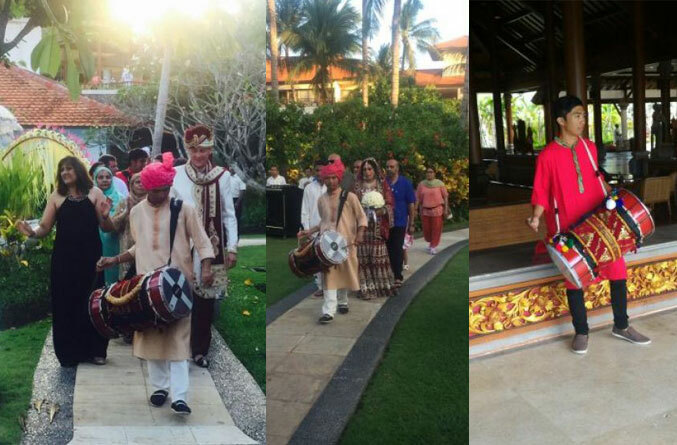 This is why the dhol is such an important detail to have at any Indian wedding. The dhol has origins in India, Pakistan and Bangladesh particularly, and is a double-ended barrel drum played mostly as an accompanying instrument. This you will hear particularly in Punjabi bhangra music, but in different forms in other music too such as Qawwali…etc. However, the dhol wasn’t made just to be an accompanying instrument, as when played alone it creates a really energising, delightful sound which will even get the most rigid of people shaking their shoulders and tapping their feet to the beat. Our Dhol Player will ensure a enjoyable experience of the tradition Indian drums time after time, giving your wedding or party that exciting and authentic Indian touch; complete with traditional Indian outfits. We provide and promote local talent of Dhol Player as we know that there is immense talent waiting to be recognized. Everyone has to start off somewhere, and this is the reason we thrive on supporting the local talent in helping them achieve their dreams.